376 pages | 148 B/W Illus. New synths with unique features and layers of complexity are released frequently, with hundreds of different synths currently available in the marketplace. How do you know which ones to use and how do you get the most out of the ones you already own? The Musical Art of Synthesis　presents synthesizer programming　with a　specific focus on synthesis as a musical tool. Through its innovative design, this title offers an applied approach by providing a breakdown of synthesis methods by type, the inclusion of step-by-step patch recipes, and extensive web-based media content including tutorials, demonstrations, and additional background information. 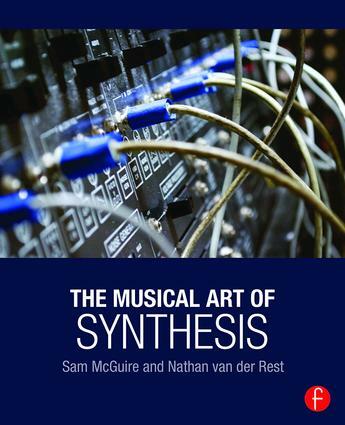 Sam McGuire and Nathan van der Rest guide you to master synthesis and transcend the technical aspects as a musician and artist. Synths are presented using a multi-tiered system beginning with basic instructions for all common synth techniques. Historical information is included for each type of synth, which is designed to help you understand how each instrument relates to the bigger picture. Advanced level instruction focuses on modern implementations and on mobile devices, with special focus on performing and practical usage. The goal The Musical Art of Synthesis is to bring all of the different types of together in the same discussion and encourage you to see the similarities and differences that force you to gain a better overall understanding of the synthesis process. •　Using a unique, multi-tiered approach applicable to the level of equipment in use, this publication introduces concepts that apply to a wide range of hardware/software synthesizers. Sam McGuire, an active audio engineer, composer, and University of Colorado Denver faculty member, is the primary author on three audio technology books and multiple audio software instructional videos. He has scored and mixed multiple award-winning documentary and feature films. Nathan Van der Rest is a University of Colorado graduate student and a professional audio engineer and composer.